Reality Check: What has the EU meant for disability rights? The claim: Former Paralympian Baroness Tanni Grey-Thompson says that "leaving the EU would prevent British people with disabilities from benefiting from upcoming legislation on accessibility". Reality Check verdict: If Britain left the EU, it wouldn't benefit from future EU legislation. The EU has been influential in the development of disability rights legislation, but leaving would not necessarily mean those rights would be lost. Former Paralympian Baroness Grey-Thompson warned leaving the European Union could prevent people with disabilities benefiting from plans to boost accessibility. In December 2015, the EU proposed the European Accessibility Act, with the hope of setting requirements for certain key products and services. They include cash machines, banking services and TV equipment. And Baroness Grey-Thompson is concerned a UK exit would mean Britons missing out. An impact assessment has been carried out as well as consultations with small and medium businesses that the act will affect. A proposed text has been published, and it will now be debated and amended by the European Parliament and European Council. It could go back and forth for debate and amendment between the European Commission, the European Parliament and the European Council several times until an agreement is reached. 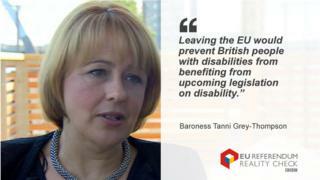 But how much has existing UK disability law has been influenced by the EU? In 1970, the UK passed the Chronically Sick And Disabled Persons Act, the first legislation in the world to recognise and award rights to disabled people. Later, in 1995, the UK introduced its first disability discrimination legislation, the Disability Discrimination Act (DDA). It covered education, transport, and the provision of goods, facilities, services, premises, employment and occupation. Under the DDA, businesses with fewer than 20 employees were protected if they discriminated on grounds of disability. The first European Union-constituted piece of legislation against disability discrimination was the Framework Directive for Equal Treatment in Employment and Occupation in 2000, setting out to protect individuals in employment against direct and indirect discrimination on account of race, sexual orientation, religion and disability. Unlike the DDA, the directive did not provide protection for companies smaller than 20 people, making the UK to remove this exemption from its law in 2004. The EU had a further impact on disability legislation in the UK in 2008. Discrimination against employees due to their carer status or relationship to a disabled person became unlawful in England, Scotland and Wales as a result of a European Court of Justice Judgement. UK carer Sharon Coleman said she had been harassed into resigning from her job because of her disabled son and had suffered "discrimination by association". The European Court of Justice ruled in her favour, saying the Employment Equality Directive "must be interpreted as meaning that the prohibition of direct discrimination laid down therein is not limited only to people who are disabled". In terms of transport, EU directives introduced between 2006 and 2011 ensure disabled people are entitled to assistance by trained staff when travelling by plane, train, bus or ship. However, in the UK, the Transport Act in 2000 set out more clearly what was meant by disability in terms of applying for travel concessions, and further defined the rights of disabled travellers and commuters and what rail companies were expected to do to ensure disabled people's safe and effective travel. Disability benefits are another area in which the European Court of Justice has intervened. Because of the Regulation on the Co-ordination of Social Security Systems 2004 (and relevant decisions of the EU Court of Justice), in certain circumstances, people from the UK can live in other EU countries and still receive some benefits, including Personal Independence Payment and attendance allowance. Law professor and director of the Centre for Disability Studies Anna Lawson has said in a paper that many positive changes in UK laws have resulted from European initiatives. If the UK were to leave the EU, Prof Lawson said, "EU law would no longer prevent UK governments from rolling them back - nor from rolling back other disability rights measures currently set out in both UK and EU law". "It would jeopardise much needed financial support for UK disabled people from EU Structural and Investment Funds - which have just been changed to place more emphasis on anti-poverty and social inclusion measures," she said. However, a report by charity The Papworth Trust suggests the UK is one of the more progressive of the 28 EU member states in terms of treatment of disabled people, and that direct lobbying of the UK government for changes to legislation would be more effective. Leave campaigners say that the EU slows down the UK's ability to make and implement laws. A representative said: "The UK acted to address disability discrimination before the EU and provides for much more extensive rights. "EU governments have a bad track record in protecting the disabled. "They should not be able to influence our policy." EU disability legislation has done much to positively change UK disability rights laws, but we do not know how they would have been amended without input from the EU. EU law governs workers' rights, but other areas of social policy are left to the governments of nation states, meaning UK law on disability is by nature more comprehensive than the EU's. However, a Brexit would remove the UK's recourse to the European Court of Justice to ensure equality rights are not interpreted too narrowly, and the UK would not automatically benefit from future developments. Reality Check: Do 100,000 North East jobs depend on EU?